This is an absolutely fabulous dish that Giuliano Bugialli makes. Although this recipe is definitely more work than most of the recipes I publish it’s really worth it! Boil the potato in salted boiling water until soft, about 45 minutes. Immediately peel the potato and rice it using a potato ricer into a small bowl. Measure out 5 oz. of the riced potato and discard the leftover. Prepare the stuffing; drain the artichokes, then finely chop the parsley and garlic together on a chopping board. Place a medium-sized sauce pan with the oil over medium heat, add the chopped ingredients and lightly sauté them for one minute. Add the artichokes and cook them for about 15 minutes or more, until very soft, adding broth if needed. Season with salt and pepper to taste. As the artichokes cook, prepare the sponge. Place the riced potatoes in a medium-size bowl, then dissolve the yeast in the lukewarm water. When ready, make a well in the riced potatoes and pour in the dissolved yeast. Mix very well with a wooden spoon, then start adding the flour a little at a time always mixing with a spoon. When all the flour is incorporated, keep mixing for two minutes more. Cover the bowl and let the sponge rest for about 45 minutes or until double in size. When ready, arrange the 3 cups of flour on a board and make a well init. Place the sponge in the well, then the olive oil and the water. Season with a large pinch of salt. Use a wooden spoon to combine all the ingredients in the well, then start mixing with your hands taking some flour from the ridges of the well. Start kneading the dough in a folding motion incorporating more flour. The amount of flour could vary depending on the contents of water in the potatoes. You must have a rather soft and very smooth dough. Keep kneading for 5 minutes more to get a very elastic and not sticky dough. 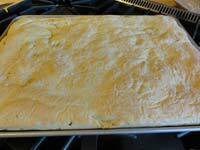 Heavily oil a 15 X 10 ‘/2 inch jelly roll pan, (or large round cake pan). 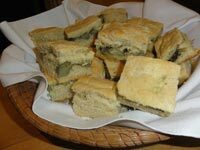 Divide the dough into two pieces–one third and two thirds. Use a rolling pin to stretch the larger piece the size of the pan. Arrange the artichokes with their juices all over. Stretch the smaller piece of dough to the size of the pan but much thinner. Be sure to seal the edges of the two layers of the dough. Use a fork to prick the top layer in several different places, then drip the remaining oil all over the top. Cover the pan and let the dough rest until it is almost double in size, about 1 hour. Preheat the oven to 375 degrees. Remove the cover from the pan, sprinkle the foccacia with coarse salt and bake for about 35 minutes, or until golden and very puffy. Serve warm, cut into slices. The leftover focaccia will become extremely soft as it cooks, because of the potatoes, but will be very crisp again when reheated in the oven. 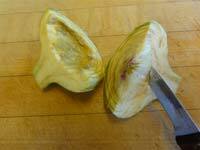 **To trim artichokes first cut off the about an inch or two of the top and most of the stem. Holding the artichoke in one hand, bend back each leaf so that it snaps at the point where it is tender, leaving the edible part on the artichoke. 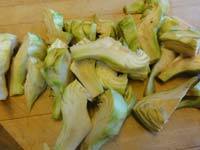 Then with a vegetable peeler or carefully with a paring knife, remove all the dark green (or inedible) part of the artichoke. 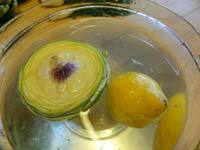 It is best to keep the cut artichokes in cold water with lemon juice to prevent them from discoloring. 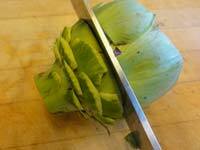 Cut each trimmed artichoke in half, then with a paring knife moving in an arch, cut out the fuzzy choke and discard. Then cut each half into quarters as directed in the recipe.